This is the fun part of your beach wedding planning... picking the perfect beach wedding dress for your theme! This wedding theme is more casual and informal and your wedding attire should match. Which one of these beach wedding locations fit you? You are having a destination wedding in at resort beach location. Your wedding ceremony will take place right on a local beach. You are having an elegant ceremony overlooking the beach. You just want a beach theme for your reception. So depending on the location where your beach wedding will take place, that will determine what you should wear for a beach wedding. First you should take the time to figure out what style of wedding dress will be best for your body shape. This is an important step that deserves your careful attention. A beach casual wedding dress is simpler in design, but no less fabulous in design than formal gowns! Avoid the big poufy gown with a long train. It doesn't work well when a wedding, takes place right on the beach. 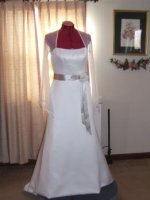 Look for gowns specifically categorized in bridal gown designers collections as "Beach wedding gowns" or "Beach Wedding Dresses" and "Destination wedding dresses". Choose a polyester or a high quality silk fiber that resist wrinkles. These informal gowns are so easy to pack and transport. They only need a little steaming to get out the few wrinkles you might have from packing. Informal Wedding Right on the Beach: When having a wedding right on the beach it is better to have a simple beach wedding dress that is pared down. What is pared down? I'm talking about a more fitted straight silhouette. Or an a-line with a minimum amount of flare is perfect for getting married right on the beach. Best Styles: A mermaid style, narrow a-line, sheath or a princess line will also work. Why do I suggest these styles? Well it can be quite windy on the beach. Narrow skirted gowns tend not to blow around quite as much, which can be very annoying. Also when it comes to a beach casual wedding dress, you don't want a long train to fuss with. The best fabrics for a beach informal wedding dress would be chiffon, organza, georgette, gauze, voile, crepe back satin and other light weight fabrics. Accessories to compliment your beach wedding dress: On the beach you should not wear heels since they will sink into the sand. A platform shoe or flip flop is best. Or you can get married in your bare feet. Your jewelry would be simple. Your veil should be minimal or not wear one at all. Long veils on the beach are hard to control in the wind. Elegant affair by the ocean: This is an affair that occurs in a country club or hotel that overlooks the ocean. For this type of wedding you can wear a little more formal bridal gown, since the venue is a more formal, upscale accommodation. You can still wear a simple beach wedding dress but glam it up a bit! How? The gown can be a fuller skirt. You can also have more details on this type of dress like crystal, rhinestone beading detailing to a touch of glamour. Some lace fabrics will work nicely to make your gown more upscale. You can have a longer veil and longer train than if you are outdoors. Your jewelry can be a little more glitzy and your bridal shoes can be more traditional. So bottom line... your beach casual wedding dress should harmonize with your personality, theme and wedding location to be your perfect wedding dress. One thing you want to consider is how to travel with and care for your gown after you arrive at your destination. This is something you need to plan ahead for.